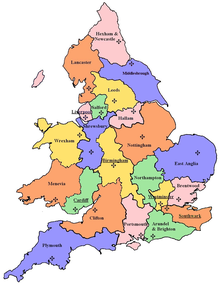 The Catholic Bishops' Conference of England and Wales is the permanent assembly of Catholic Bishops and Personal Ordinaries in the two member countries. The membership of the Conference comprises the Archbishops, Bishops and Auxiliary Bishops of the 22 Dioceses within England and Wales, the Bishop of the Forces (Military Ordinariate), the Apostolic Eparch of the Ukrainian Church in Great Britain, the Ordinary of the Personal Ordinariate of Our Lady of Walsingham, and the Apostolic Prefect of the Falkland Islands. Each department consists of bishops and staff, and is chaired by one bishop. Other bishops contribute as episcopal staff, and there are a few other members serving as staff. Each department is further subdivided into committees; a separate member of the episcopal staff of that department oversees the reports and work of their committee. CSAN, the domestic[clarification needed] social action agency - "CSAN (Caritas Social Action Network) is the social action arm of the Catholic Church in England and Wales"